Welcome to the Beitchman Orthodontics family! Now that you have begun orthodontic treatment, you’ll need to take extra care of your teeth and appliances to make sure your treatment is a success. If you ever have any questions, simply ask a member of our team. We take the time to listen to your concerns and make sure that all your questions are answered. The value of good oral health and a healthy bite is almost immeasurable—whether you are six or 86! For us, it is gratifying and pleasing to see someone with a beautiful smile, but even more important is the gift of a healthy bite. 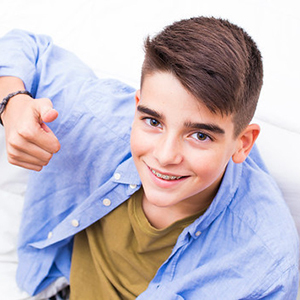 Orthodontic treatment can prevent serious problems that stem from a bad bite: deep overbites or crossbites can wear down and destroy teeth and gums. Good orthodontic treatment in combination with restorative treatment by general dentists can repair the damage, but one of the biggest pros in orthodontic treatments is preventing it in the first place. Today, orthodontic treatments can range from just a number of weeks to many months depending on the severity of the problem. With today’s advanced technologies it is not uncommon to have a patient in our office have a beautiful smile in as little as ten weeks! Our office also now offers Ortho Pulse, a revolutionary treatment which research has shown can cut orthodontic treatment times almost in half! For treatment to succeed it is also very important for us to see you on a regular basis. Appointments at our San Antonio and Boerne, TX offices are scheduled about six weeks apart and are necessary for Dr. Beitchman to observe your progress. Whether you have fixed or removable appliances, make sure to follow our specific instructions on how to take care of them. We recommend the use of Waterpik and Sonicare devices for good oral hygiene when wearing fixed appliances. We ask that you take at least two minutes twice a day when brushing with braces. First, go over your appliance with the Waterpik device. Then, whether you are using a manual or electric toothbrush, we recommend brushing above and below each bracket, followed by the gum line, biting surfaces, and the inside surface of teeth. Floss threaders can be used to thread the floss underneath the archwires, and will be provided to you at no charge. Discomfort stemming from orthodontic treatment varies from individual to individual. Having worn orthodontic appliances himself, Dr. Beitchman remembers what they felt like and always tries to make his patients as comfortable as possible. Don’t be surprised if he asks you if you’ve had any discomfort since your last visit. We find that the majority of our patients only report soreness for a few days after getting their braces put on.